Work safely at any height. At MSA, we know that fall protection isn’t just about stopping falls. It’s about eliminating fall risk in the first place. From walkways to rooflights, keep your workers—and your roof—safe and secure. For permanent installation or one-off repairs, MSA Latchways roofing solutions are fully compliant and designed to fit nearly any roof configuration. An easy-to-install, reliable and cost-effective rooftop safety solution for standing seam roofing, composite roofing, membrane roofing, and more. Living (safely) on the edge. Your job brings enough surprises. Leading edges shouldn't be one of them. Modern engineering and innovative design make this the most advanced leading edge self-retracting lifeline available. Tailored vertical systems for fall protection at any height. Provides constant attachment (and peace of mind) while allowing your hands to be free for climbing. Safe workers and safe aircrafts during construction, repair, or maintenance. MSA Latchways offers both freestanding and overhead systems for flexible safety needs for your facility. 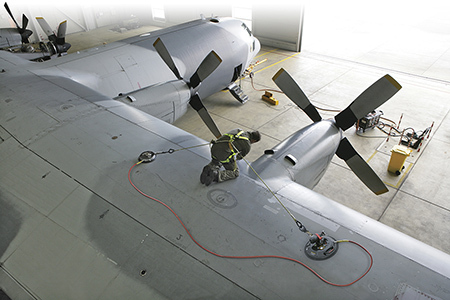 A vacuum anchor fall protection system providing single fall protection for workers on wings, fuselage or stabilizers. We know the challenges you face up high each day. We’ll make sure you come down safely every time. Lanyards and lifelines that have your back. Durable. Offer consistent, year-after-year performance in the toughest environments. Innovative. The latest energy-absorbing technology and designs ensure you have the most advanced equipment on the market. Customizable. Whether permanent or temporary, horizontal or vertical, there's a fall protection system that's just right for your job. Adaptable. You'll find our systems used in aerospace, mining, oil and gas, fire service, construction, utilities, general industry, and everywhere else where fall protection is critical. Cutting-edge. Our patented constant force technology makes design and installation easy without sacrificing energy absorption. Construction: All products offer superior comfort in work positioning applications. Tower: Harnesses come with a comfort seat to make long work shifts far more comfortable. Arc Flash: 100% Kevlar webbing is fire-resistant and self-extinguishing. Interested in trying out an MSA V-Series product, self-retracting lanyard, personal fall limiter, or harness?